LASTS ALL YEAR. GUARANTEED! * High-quality paper resists ink bleed** 1 subject; 100 college ruled sheets. Patented, reinforced storage pockets. *** 1 divider with 2 pockets; water-resistant plastic cover; Spiral Lock wire. Neat Sheet perforated pages of 11" x 8 1/2”easily tear out. Made in the U.S.A. Overall size of 11" x 9". Pack of 6. 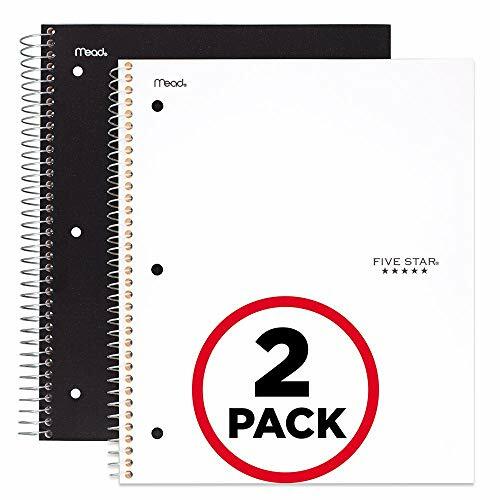 *ACCO Brands will replace any Five Star notebook that is returned within one year from the date of purchase. This guarantee does not cover damage due to misuse or abuse. Contact ACCO Brands Consumer Affairs for instructions. ** Ideal for notetaking and homework, you can write on both sides of the paper and notes will stay clear and legible. **Under normal usage, paper resists ink bleed with common student writing instruments such as pencils, ball point pens, gel pens, felt tip pens and highlighters. ***Based on independent laboratory test results that establish pocket tear strength as compared to non-reinforced pockets in Five Star notebook. LASTS ALL YEAR. GUARANTEED! * Patent-pending movable pocket dividers let you organize the notebook your way! 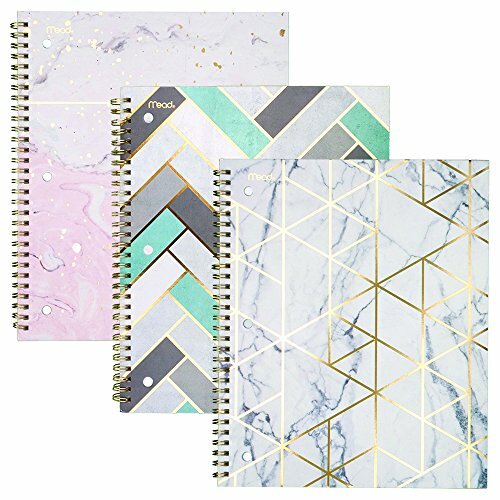 5 subject notebook with plastic front and back covers, and 5 dividers, has 200 college ruled sheets. Hold more hand-outs and notes in the 2 expanding pockets on each divider. Colored tabs on the plastic dividers let you color-code sections of the notebook by subject or topic. It’s easy to label your notebook on the spine’s writable label, and an exterior pen loop keeps a pen or pencil handy. Fabric Spiral Guard covers the wire to prevent snags on clothes or backpacks. Neat Sheet perforated pages easily tear out with clean edges. Perforated sheets measure 11" x 8 1/2" when torn out. Overall size of 11" x 10 3/16". 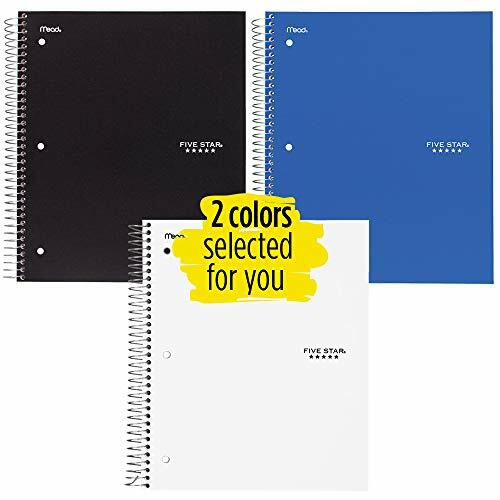 *ACCO Brands will replace any Five Star Advance Spiral Notebook that is returned within one year from the date of purchase. This guarantee does not cover damage due to misuse or abuse. Contact ACCO Brands Consumer Affairs for instructions. 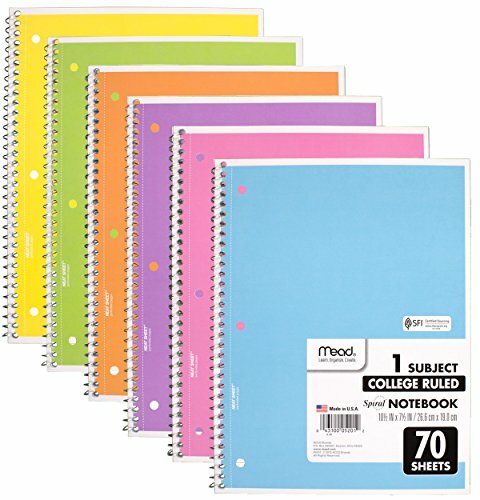 Basic 1 subject notebook, college ruled, available in a variety of colors. It's versatile and perfect for a variety of uses including in-class note taking and recording meeting notes. 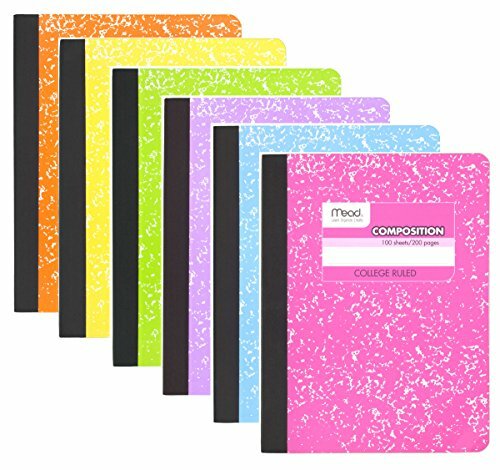 6 Pastel Color Notebooks per pack. LASTS ALL YEAR. GUARANTEED! * High-quality paper resists ink bleed** 5 subjects; 200 college ruled sheets. Patented, reinforced storage pockets. *** 4 dividers, each with 2 pockets; water-resistant plastic cover; Spiral Lock wire. Neat Sheet perforated pages of 11" x 8 1/2” easily tear out. Made in the U.S.A. Overall size: 11" x 10”". 2 Pack. 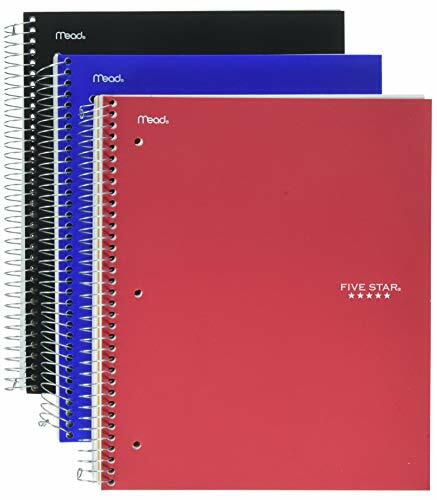 *ACCO Brands will replace any Five Star notebook that is returned within one year from the date of purchase. This guarantee does not cover damage due to misuse or abuse. Contact ACCO Brands Consumer Affairs for instructions. ** Ideal for notetaking and homework, you can write on both sides of the paper and notes will stay clear and legible. **Under normal usage, paper resists ink bleed with common student writing instruments such as pencils, ball point pens, gel pens, felt tip pens and highlighters. ***Based on independent laboratory test results that establish pocket tear strength as compared to non-reinforced pockets in Five Star notebook. 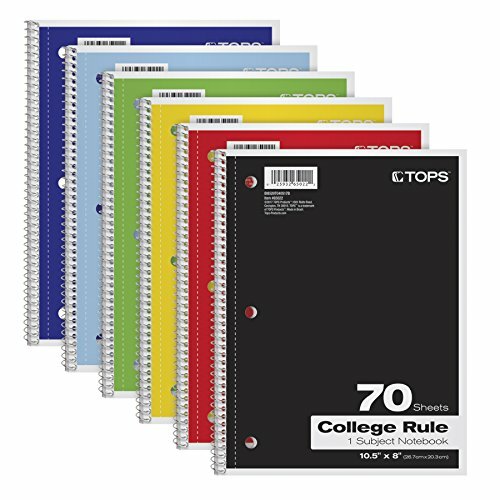 Basic 1 subject 100 Sheet notebook, college ruled, available in a variety of colors. 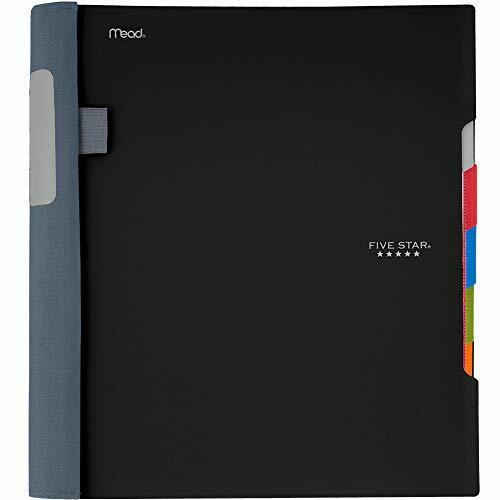 It's versatile and perfect for a variety of uses including in-class note taking and recording meeting notes. 6 Pastel Color Notebooks per pack. LASTS ALL YEAR. GUARANTEED! * High-quality paper resists ink bleed** 3 subjects; 150 college ruled sheets. Patented, reinforced storage pockets. *** 2 dividers, each with 2 pockets; water-resistant plastic cover; Spiral Lock wire. Neat Sheet perforated pages of 11" x 8 1/2”easily tear out. Made in the U.S.A. Overall size of 11" x 9 7/8". Pack of 2. 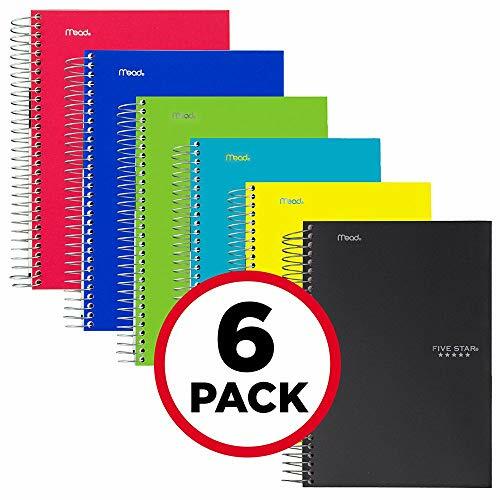 *ACCO Brands will replace any Five Star notebook that is returned within one year from the date of purchase. This guarantee does not cover damage due to misuse or abuse. Contact ACCO Brands Consumer Affairs for instructions. ** Ideal for notetaking and homework, you can write on both sides of the paper and notes will stay clear and legible. **Under normal usage, paper resists ink bleed with common student writing instruments such as pencils, ball point pens, gel pens, felt tip pens and highlighters. ***Based on independent laboratory test results that establish pocket tear strength as compared to non-reinforced pockets in Five Star notebook. Note: Color choice is not available for this item. Colors shipped to you are selected at random, and will vary. As part of the Mead Fashion Collection, the Modern Chic Wirebound Notebook is crafted of covers that portray various natural stone elements highlighted by attractive designs of gold foil accents. 10.5 x 8 perforated sheet size. College ruled, white paper. 80 ct. Perforated. Assortment of three designs. Gold twin wire and gold foil design accents. Shopping Results for "College Notebook"